Media Strategist and Digital Content Creator Sheree Martin interviewed me earlier this week for her Birmingham Shines Podcast. You can listen to the podcast by clicking here. 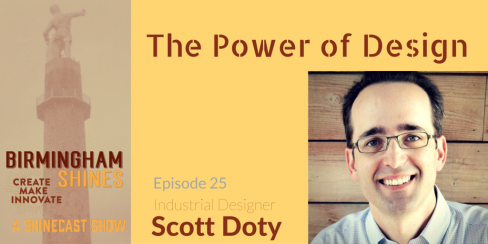 We discussed the value of both inspiration and research in the design process, ethnographic research, design thinking, college chemistry classes, how I decided to pursue a design career, as well as my favorite design book, The Design of Everyday Things by Donald Norman. I also had the opportunity to plug Design Week Birmingham 2015 which takes place all next week. 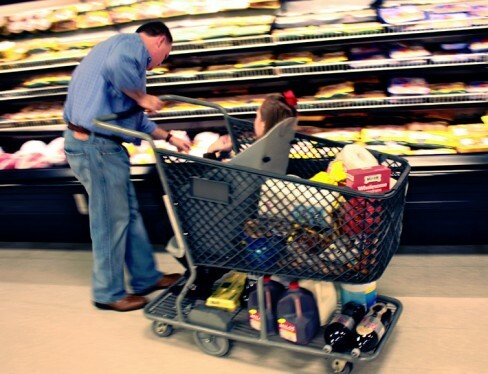 In 2006-2007 Drew Ann Long of Alabaster, AL began to realize that she would soon no longer be able to fit her special needs daughter, Caroline, into a standard supermarket shopping cart. She would then be faced with a choice between trying to fit her daughter into a standard shopping cart, which is both difficult and dangerous, or the frustrations of trying to operate a wheelchair and a shopping cart at once. What began as a search for a product that Drew felt must surely exist, led to her marketing / manufacturing and selling her own carts in 18 states. She most recently licensed her design to the largest manufacturer of shopping carts in the world. I had the pleasure of interviewing Drew about the product development process for Caroline’s Cart. I was impressed with her extremely methodical approach to product development. The fact that she researched her market thoroughly and spoke early on with one of the leading manufacturers in her category lead to a relatively smooth development process. When I asked Drew about her “aha” moment, she explained that the initial idea for the cart came to her as her daughter Caroline began to outgrow standard supermarket carts. 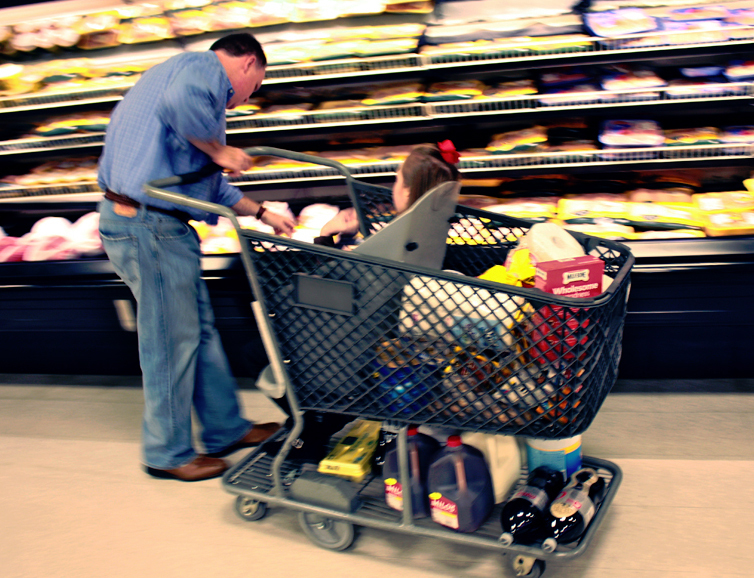 Shopping carts have been traditionally designed to accommodate toddlers from 2-3 years of age. 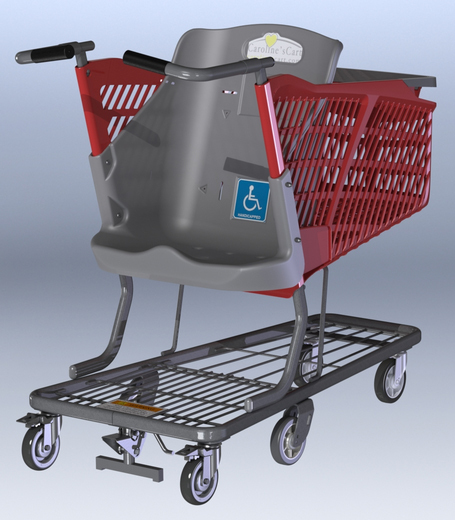 With the large variety of shopping cart designs available at the various big box stores, Drew initially assumed that a special needs shopping cart was surely in use on the west coast, etc. and that all she needed to do was bring it to the attention of retailers in small town Alabama. After locating what she was looking for proved frustrating, she was eventually surprised to learn that what she was looking for did not exist in any form. She then used a firm to develop 3d drawings which she shared with Technibilt, then North America’s largest manufacturer of shopping carts, now part of a German owned international conglomerate that is the world’s largest. The initial response from Technibilt was enthusiastic and very positive. They confirmed that they had never seen anything like it before. When she asked why they thought that was they conjectured that it was because no one had ever tackled the problem before. Technibilt felt confident that retailers would buy it but they told her that she needed to get the word out and create demand first. “Blow it up” were the exact words used by her contact at Technibilt. He told Drew that when consumers and retailers see her cart in action they would want it. Drew found this very energizing and she was ready to take the next step. It was at this point that she began work with Indesign, an engineering firm based in Indianapolis, to create a working prototype of her shopping cart concept. A mere 13 months later she was back at Technibilt. Impressed with the prototype, they remained very enthusiastic about the project but they still were not interested in manufacturing it internally. At this point they even provided her with contacts at various retailers with the suggestion that she manufacture and distribute it herself. The search for a manufacturer took several months but she eventually found a small manufacturer nearby in Georgia. They had never made a shopping cart before, but they convinced Drew that they would be able to pull it off. The manufacturer created two additional rounds of prototypes internally and eventually provided her with a production sample that worked quite well. I asked her if there were any improvements that they needed to make after distribution began, but she explained that her cart is now available at various retailers in 18 states and that there has been nothing but positive feedback from grateful parents. In fact, the only problem that they have had is keeping up with demand. I was impressed that she had chosen to employ a professional PR / marketing firm. She worked with local firm, Panorama PR, based in Birmingham, AL. I expressed to Drew that I have often seen new entrepreneurs choosing to take PR and marketing on themselves. Sometimes this works out quite well but often they find it to be overwhelming. She explained that though Facebook has been great for getting the word out to her target market, Panorama PR was instrumental in reaching out to the general media and in getting her coverage that she would not be able to obtain on her own. After selling her own carts for some time, Drew had finally accepted that she would be manufacturing and distributing Caroline’s Cart herself permanently. Some time after this, Technibilt reached out and informed Drew that they were now interested in manufacturing and distributing Caroline’s Cart. Technibilt had recently been purchased by a German company which happens to be the world’s largest manufacturer and distributer of shopping carts. Since Drew had both domestic and international patents, they were able to work out a deal which will soon see Caroline’s Cart available world wide. Retailers from Africa, Australia, Europe, etc. have already expressed an interest in purchasing her carts when the Technibilt version comes to market. Though the basic design and functionality was in place before Technibilt took over manufacturing, their internal engineering team made some changes to both the aesthetics and manufacturing processes which have improved both the look and the feel of the product. Drew described this as going from driving a Yugo to driving a Mercedes. She feels that working with such an experienced manufacturer in her category gave the final product an extra layer of polish. Look for Caroline’s Cart in stores this fall. The Technibilt version of Caroline’s Cart launches internationally August 1st, 2013. Do you take your sense of touch for granted? Sameer Doshi, recently blind, has taken to modifying his environment to make it easier for him to use. While this is common practice for those with significant to severe vision loss, it’s not something that those of us without a vision impaired friend or loved one have probably thought a lot about. 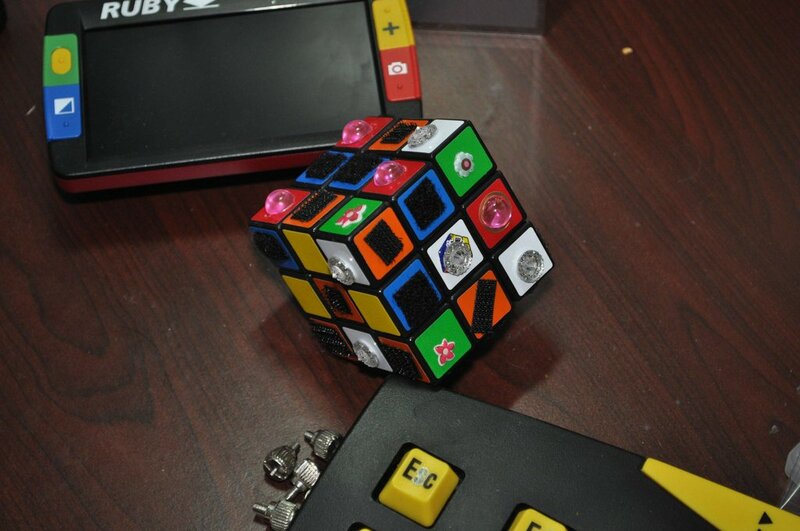 One of the ways that he has done this is by adding stickers, bumps, and pieces of velcro to identify buttons by feel. He explained to me that he has modified household items and appliances such as his dishwasher, microwave, and keyboard. For example, he placed little plastic bumps on the buttons of his microwave in such a way as to differentiate the “start”, “add 30″, and “popcorn” buttons from one another. Missing the games that he used to enjoy, he recently modified a Rubik’s cube so that it could be played completely by feel. To me, this seems like it would make an already very difficult puzzle more challenging. 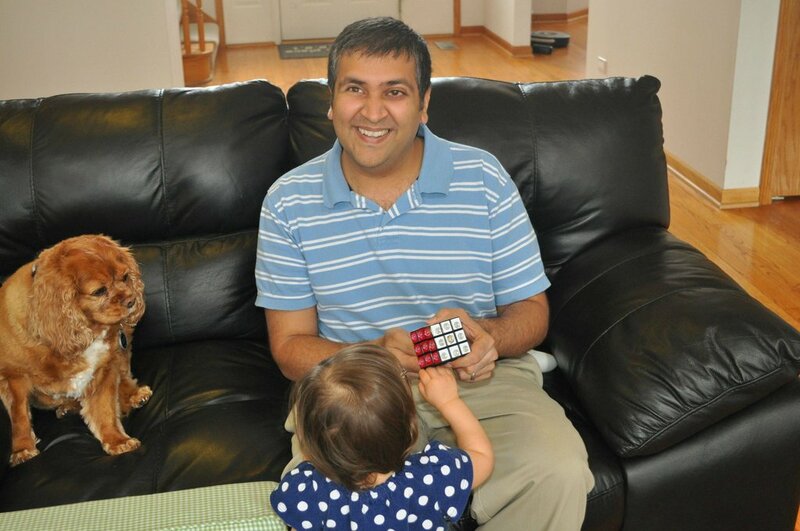 As you can see that didn’t stop Sameer from solving it. 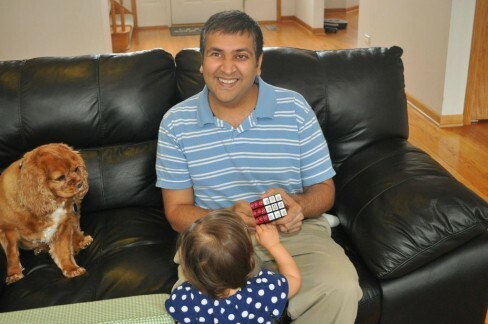 He used velcro squares, plastic gems of differing shapes, and [I'm guessing] his daughter’s Dora the Explorer puffy stickers to tell the various sides / colors of the cube apart. He noted that the hooks and loops of velcro feel distinct, so he was able to use each of these textures for a different side of the cube. This got me thinking about some recent electronic devices that I have been designing. I explained to Sameer that I have been working very hard to ensure that each of the buttons that I use can be differentiated by feel. I have noticed that I am often trying to work electronic devices in the dark and that it can be quite challenging depending on the attention paid to the tactile differentiation of the keys, etc. Sameer mentioned that the Nintendo SNES controller was a great example of tactile design, as its designers used both concave and convex buttons to great effect. He also suggested that I consider using differing textures on my buttons in addition to the other cues that I had considered such as differing materials, convexity vs. concavity, bumps of various sizes, etc. I am embarrassed to admit that even though I am a rabid fan of noted interaction designer, Don Norman’s books [which discuss the tactile aspects of design], it hadn’t occurred to me that I was actually making these devices easier to use for the visually impaired. In seeing Sameer’s “Tactile Cube” I was reminded that the ways in which users modify objects to suit their needs can be a great source of insight into how to make products better. What products that you have used are easy to use by feel alone? Can you think of any gadgets that are frustrating to use in the dark? Please post your responses in the comments below! Sameer is currently running for Representative in the 82nd district of Illinois. You can find out details and volunteer here. Additional information about modifying the environment for the visually impaired can be found at VisionAware.org. I originally became aware of Sameer when he posted the pictures show here on Reddit.com. ©2019 Scott Doty. Design by Purr.